A game jam is a great way to get developers together for an event or cause. We were the first site to allow anyone to create a customized game jam with just a few clicks. The premise is simple: create a page and bring together developers to participate in a community and submit a game within the designated time limit. Game jams are a big part of itch.io so we're always listening to the feedback and improving how our jams system works. Here's the latest set of updates that we hope you enjoy! If you have any suggestions feel free to leave a comment. Judge — Allowed to vote on entries, even if they didn’t submit. You can combine this with judge only voting to limit voting to a specific set of people. You can combine them as you see fit, for example, if you need someone to be displayed as a host but they don't need access to edit the page then just select the "Host" option. Ranked jams are special jams that allow for people to vote on the submissions based on a set of special criteria. We've added a new rating mode, judges only, that lets only those marked as judges vote. Combined with the new Judge contributor type listed above, you can give rating access to a list of approved accounts only. You can find the new rating mode on the jam's edit page. Additionally, judges have a special ability for the other rating modes: they can always vote on entries regardless of whether they've submitted to the jam. The comments area on a jam submission page is a great way to give feedback about a particular entry. It was also implemented well before we had the more fully featured commenting system for project pages. 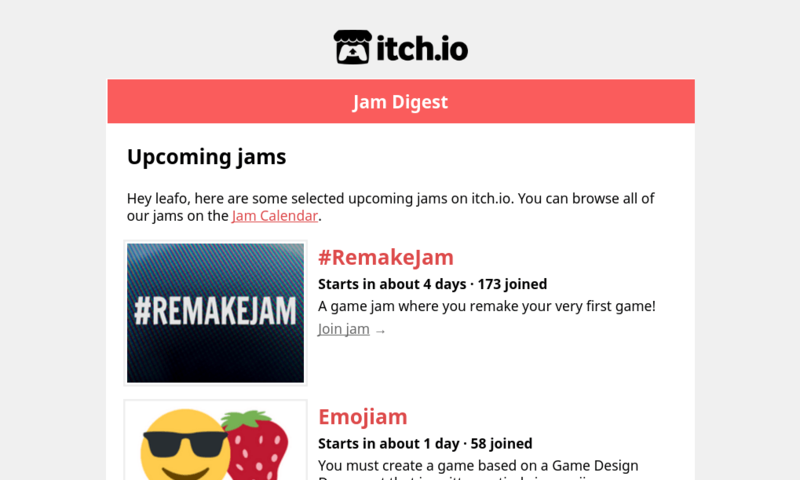 We've brought over the new system to all jam entry pages. All entries now have the functionality you're familiar with such as nested replies, avatars, reports, blocking, and notifications. 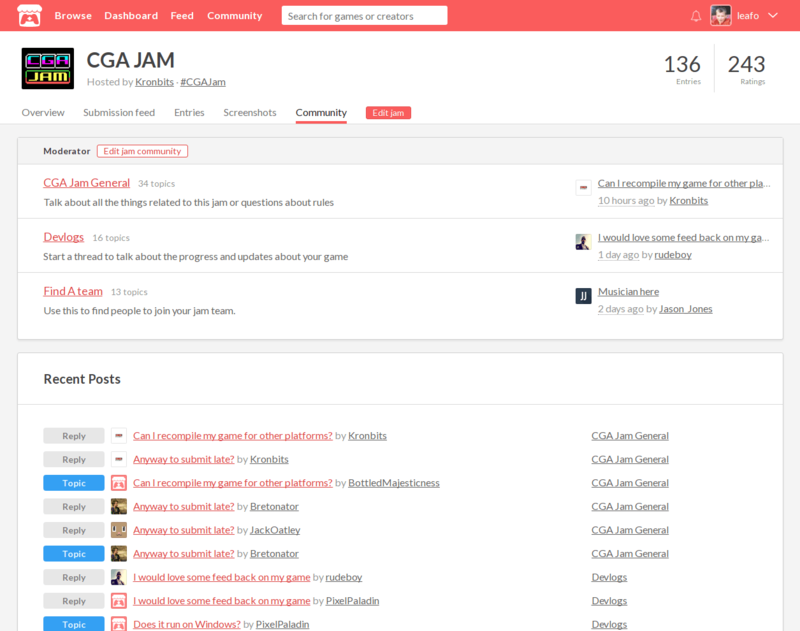 Over 3,000 jams have been created on itch.io, resulting in over 15k games. Every week there are a handful of new and interesting jams. We're starting a new email digest highlighting our picks. We'll send out a semi-weekly email to anyone who has opted in from their account settings page. All jam community pages (topics, posts, replies, etc. 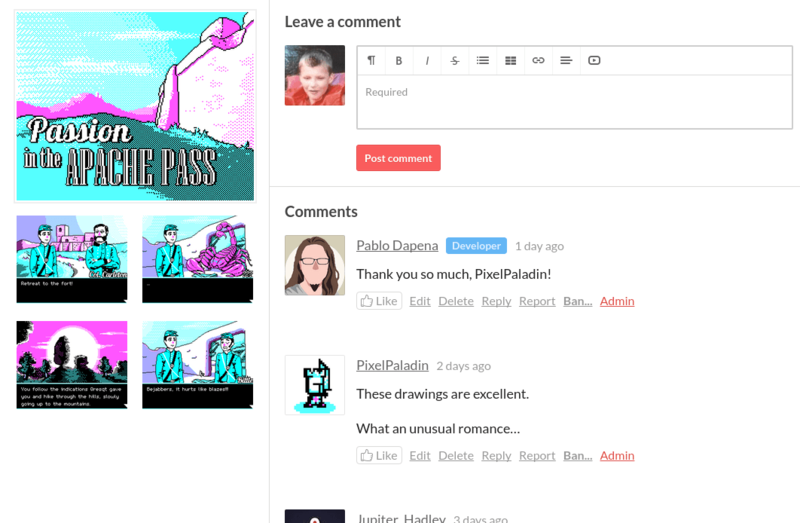 ), and jam entry comments will automatically add flair next to a post's author that shows their participation in the jam. If they submitted an entry you can quickly navigate to it, or you can see if they're a host or a judge. Sometimes a title isn't enough to convey what a jam is about. We've added a new "subtitle" field to the jam edit page where you can give a quick one-line summary that we'll display along with your jam's title when listing it. Jam communities that use a hierarchical structure will now show a post overview on the main page where you can see all the latest activity in the community. You can see an example with the CGA Jam community. Hey! We're a Philadelphia game dev community and we do jams literally every month. These tools have been so great and always stoked to see them get better. The digest is rad. Right now we're just throwing all the games into collections to show on our page, is there a better we should be trying to show off our jams in perpetuity? Looks like you're making collections for each jam you host right now, right? I think the best solution would be to just have a way to put a jam on your profile so you don't have to do any manual collections. Would that be a good solution for you?